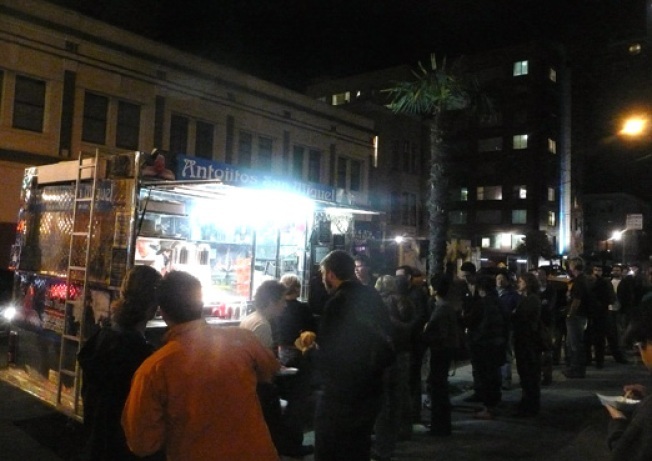 The Mission: Following last week's hyped debut, the Thursday-only Mission Street Food truck made its encore last night on the corner of 21st and Mission. Some kinks were improved from its trial run, but at peak times, the wait still was in the 45-minute range. That, of course, did not deter all kinds of pork belly lovers from queuing up with dozens of other people who most likely wouldn't usually hang out on 21st and Mission in the later evening hours. Plus, as a bonus to the menu, there was a daily special in the form of Asian pear slaw for two bucks. Gourmet food trucks: they're a beautiful thing.